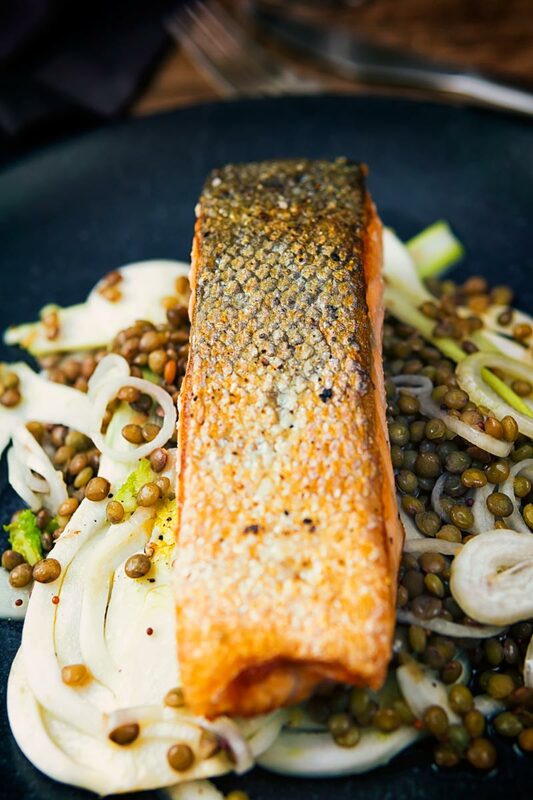 A perfectly pan fried salmon fillet is served on a puy lentil and pickled fennel salad for a perfect mid-week dinner. Why is it a perfect mid-week dinner? Because it is all done in 30 minutes, including the pickling! 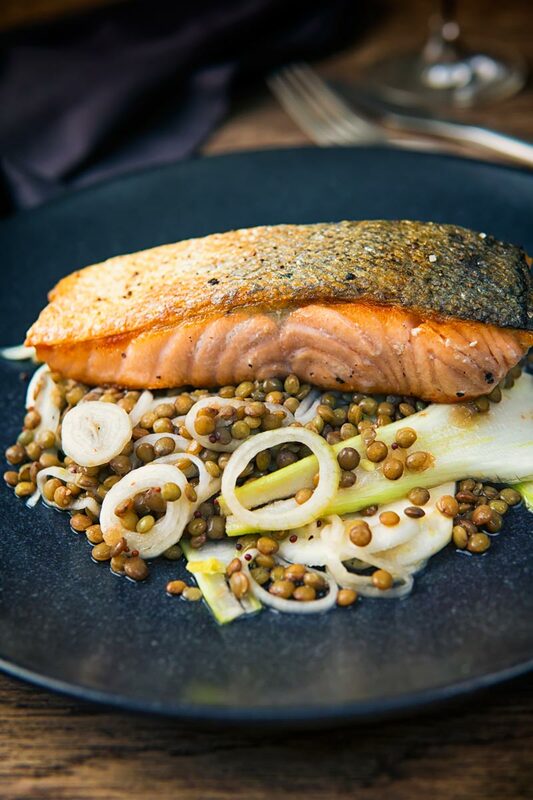 Pan Fried Salmon With Quick Pickled Fennel and Lentils. This pan fried salmon recipe comes as a contrast to some of the more hearty and heavy recipes I have published of late. It is light, bright and fresh cooks really quickly but still contains the big flavours I pride myself in. Quick pickles always add a huge amount of flavour and sharp flavours always work well with fish. So the combination of fennel which is heavenly alongside a rich salmon fillet in a quick pickle is magic. 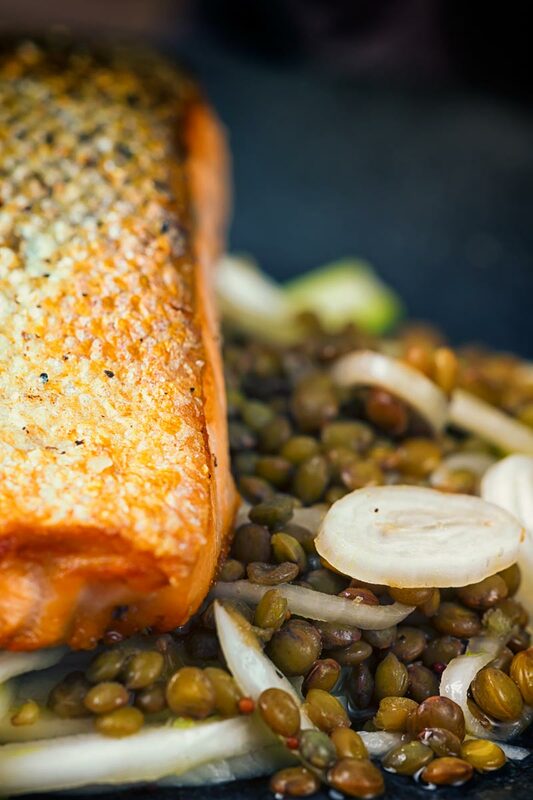 Lentils provide an earthiness in the same way as they do in my herb-crusted baked salmon recipe. The kicker is that this recipe that looks as good as it tastes is all wrapped in 30 minutes. How To Pan Fry Salmon Perfectly? The first thing to ensure you do when cooking pan fried salmon is to dry it. Particularly if you want crispy skin! Let it sit on some kitchen paper and dry both the flesh and skin side as well as you can. If you want to add flavour and a wet marinade you should check out my teriyaki salmon recipe for a different technique. After that it is all about temperature control, we are not talking mad skills here. Just patience and observance. Begin by heating your pan over a medium-high heat before adding your oil. When the oil shimmers and seems to change ‘texture’ or viscosity add in the well-seasoned salmon skin side down. The Perfect Crispy Skin On Salmon. When you put the fish in the pan the skin wants to contract. So press it gently against the pan with a fish slice. You will only need to do this for 60 seconds. Then reduce the temperature to medium or medium-low and let it sit. Do not touch the salmon! Leave it alone and let it cook for 5-6 minutes. Playing with it before risks it sticking and ruining that skin. All you then need to do is flip and cook for another minute or two. The Joy Of Quick Pickles. Pickles have formed a much greater role in my cooking in recent years. This is not the first time I have used quickly pickled fennel here on my site with it forming the side to my harissa pork tenderloin recipe. 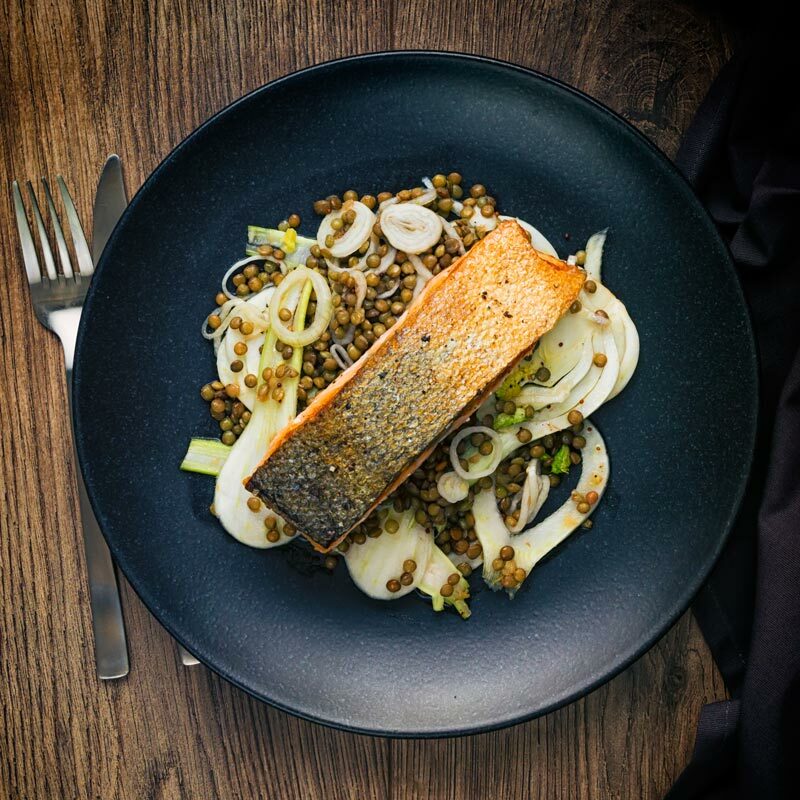 The version of pickled fennel is a little different for this pan fried salmon recipe is a little different to that one. That is the joy of quick pickles they can be changed and moved depending on what they are to be served with. Here we are serving with rich oily salmon so we go for a higher vinegar level. If you are putting your pickles with something less robust you can simply reduce the vinegar level. Place the white wine vinegar, water, peppercorns, mustard seeds, sugar and one tablespoon of salt in a pan and bring to the boil. Whilst this is happening finely slice the shallot and fennel and place in a bowl. Cut the onion in half and place in a bowl of water with the bay leaf and bring to the boil. When the vinegar pickling mix comes to a boil remove from the heat and allow to cool for 2 minutes before pouring over the fennel and shallots. Picking out the peppercorns now avoids eating them later. Let the fennel and shallot steep for 25 minutes. By now the water, onion and bay leaf should be boiling, add in the puy lentils and allow to simmer for 25 minutes. Whilst this is happening prepare the salmon by ensuring that it is dry. About 5 minutes before the onions and pickles are ready, heat a pan over a medium high heat. Add the cooking oil to the pan and when it begins to shimmer season the salmon generously with salt and pepper. Place the salmon in the pan skin side down and hold it flat for 20-30 seconds to prevent the skin from contracting. After a minute reduce the heat to medium low cook for 4-5 more minutes. By now you should be able to drain the lentils and mix together with the fennel and shallot. Season with salt and pepper, add the olive oil and then a little of the pickling liquid to taste. Now you are good to flip the salmon and cook for another 60 seconds. 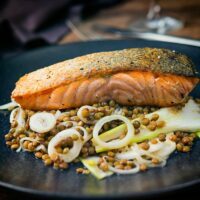 Place lentils and fennel on the plate and top with the salmon! Oh! Three ingredients I love! 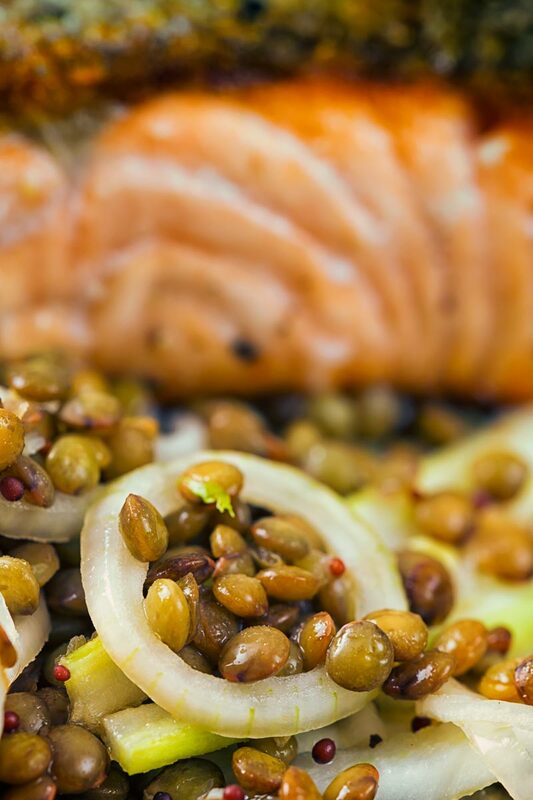 Pickling the fennel and adding to the lentils is an awesome idea. Just pinned this to make for my family. Thank you for sharing! Thanks Susan, I hope you enjoy, lot’s of my favourite things in this recipe too! Ooohh! Salmon is our all time favorite fish! I love a quick pickle, but haven’t tried lentils or leeks! So intriguing! I must give it a try! I bet they add such a lovely contrast to the rich salmon! It never ceases to amaze me how ingredients that are commonplace in one part of the world are almost unheard of in other parts. You must hunt down leeks, they are the most wonderful member of the onion family! Pan fried salmon is one of my favorite dishes! Lentils and fennel aren’t used enough in cooking- I’ve to give this one a try. Such a yummy combo of flavors. I’ve been cooking with lentils quite a lot of late but have always loved fenne, that light aniseed flavour is an all-time favourite of mine! Look at that crispy salmon skin! This dish looks so inviting. Can’t wait to try! It sounds delicious! I especially like the way the fennel and lentils are pickled as it must give the dish a lovely light flavour. 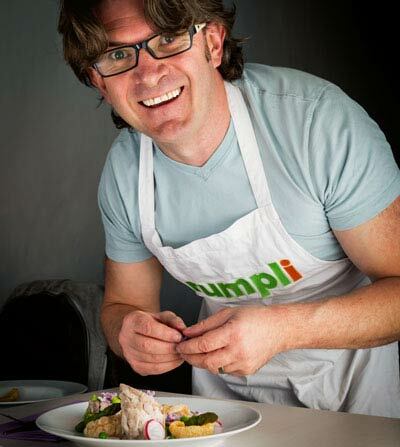 Thanks Corina… I love adding lightly pickled vegetables to recipes, they add so much!